Based on ODOT requirements, Legacy selected a PVC Architectural Fabric manufactured by Seaman Corporation to complete the structure. 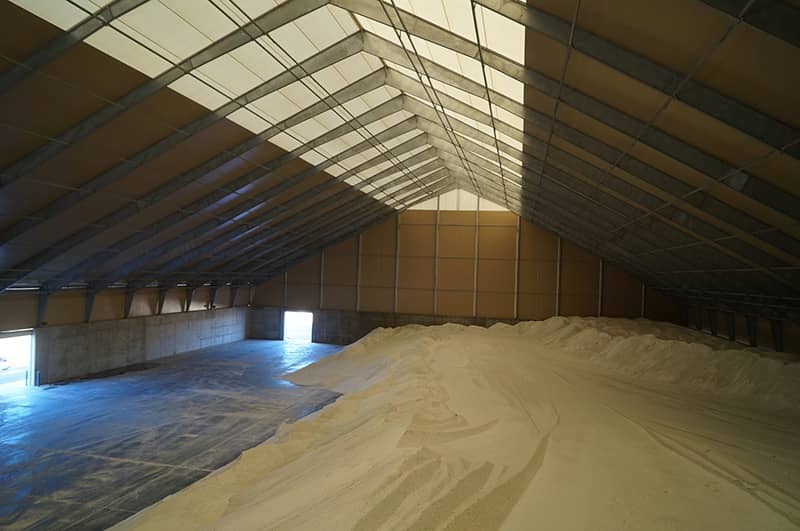 In 2012, the Oklahoma Department of Transportation (ODOT) needed a new bulk salt storage facility to house roadway deicing salt. This massive new facility at the Tulsa Port of Catoosa needed the capacity to store 50,000 tons of salt, and would almost double the available storage at the time in Oklahoma. Overseeing improvements at the Port of Catoosa was Craig Swengle, P.E. an Associate Vice President for Dewberry Engineers Inc., and the primary engineer/architect at Port of Catoosa. According to Swengle, this new building allowed for ODOT to "dispense the salt stored at this new location to maintenance distribution sheds before major snow or ice events during the winter. Previously, salt was stored in the open and covered with tarps after being off-loaded from barges. The new building will protect the salt supply from being compromised by wind and precipitation."